Enjoy this Ramadhan with a Juadah Kampung Feast! 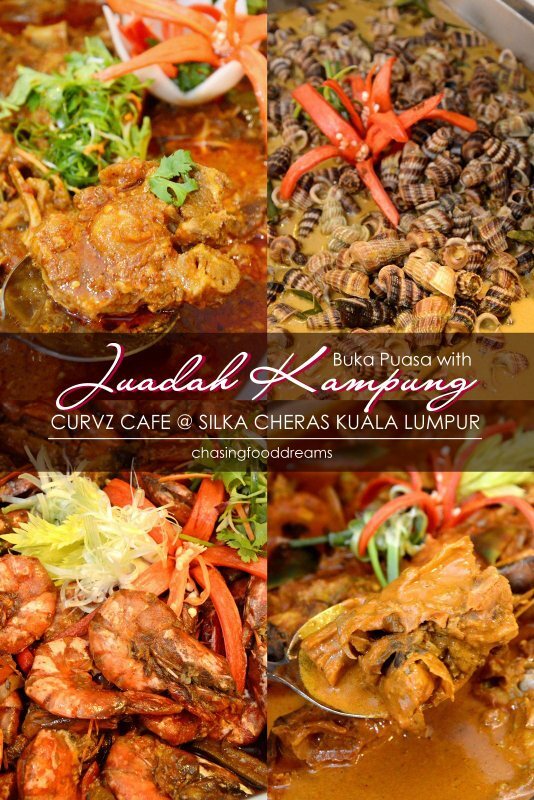 My seventh installment of the Buka Puasa food trail led me to the newest hotel in Cheras at Curvz Café, Silka Cheras Kuala Lumpur. This time, the feast is themed as ‘Juadah Kampung’ Buka Puasa Buffet where more than 100 types of mouth-watering authentic kampung dishes are whipped up by the hotel’s award winning Chef Badrul and his culinary team. Curvz Café is beautifully spacious and bright with minimal clean interior design. The buffet spread is nicely set around the whole restaurant so one can enjoy roaming the place to savor the delicious spread. I loved how pieces of modern and colorful glass pieces are placed around the hotel and restaurant to inject in some colors and liveliness. Juadah Kampung buka puasa buffet highlights include Chef Badrul’s authentic recipes of Rendang Tok Kuala Kangsar, Ekor Lembu Assam Pedas, Ayam Masak Merah, Kari Kepala Ikan, Sambal Udang Terung Pipit, Sotong Sumbat Masak Lemak, Balitong Masak Lemak Cili Padi and Sayur Tumis Bendi ala Mamak. I highly recommend the gorgeous Ekor Lembu Assam Pedas for its robust sourness and spices with tender oxtail that has been braised for hours to reach such deliciousness. The Ayam Masak Merah is beautiful as well for its balance of sweet and tomatoey richness. Sup Rusa for some comfort! There is also Nasi Briyani stuffed with raisins, nuts and spices to be savored with Roasted Lamb or Roasted Spiced Chicken. 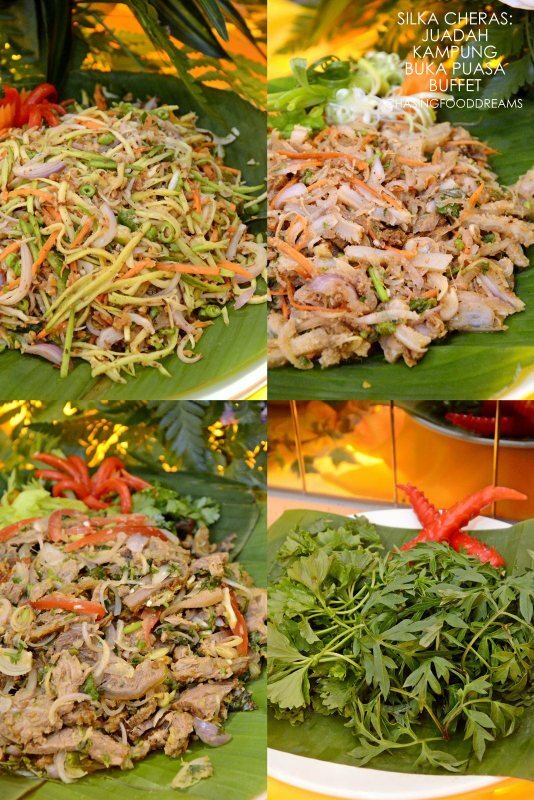 There are also plenty of Ikan Panggang, Satay and Rojak Pasembur to tempt your appetite. Kerabu station is filled with a lovely array of Kerabu Mangga, Kerabu Perut, Kerabu ala Thai, Ulam, Sambals, Keropok, Ikan Masin, Telur Masin and more. Hit the Noodle station for a taste of Assam Laksa Utara and you will be rewarded with a bowl of sour fish gravy amped up with spices and herbs to go with the Laksa noodles. 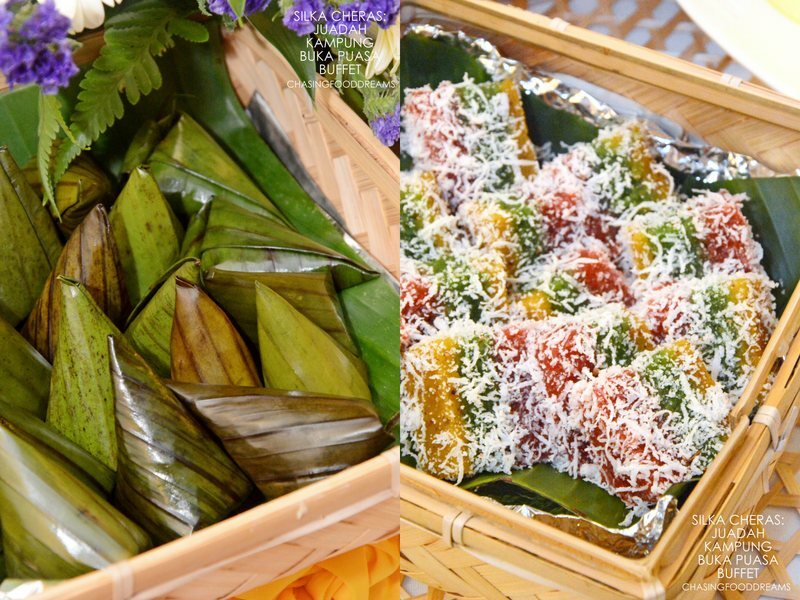 End the evening with the buffet spread of sweet desserts showcasing Malay Kuih Muih, Popiah Basah, Santan Kelapa dengan Sagu, Pengat Pisang dengan Sagu, Bubur Kacang Hijau, Puddings, Cakes, Fruits, Bread Pudding and more. The above are just a sneak preview of what the buffet has to offer so make sure to check out the buka puasa buffet spread this month at Silka Cheras Kuala Lumpur! 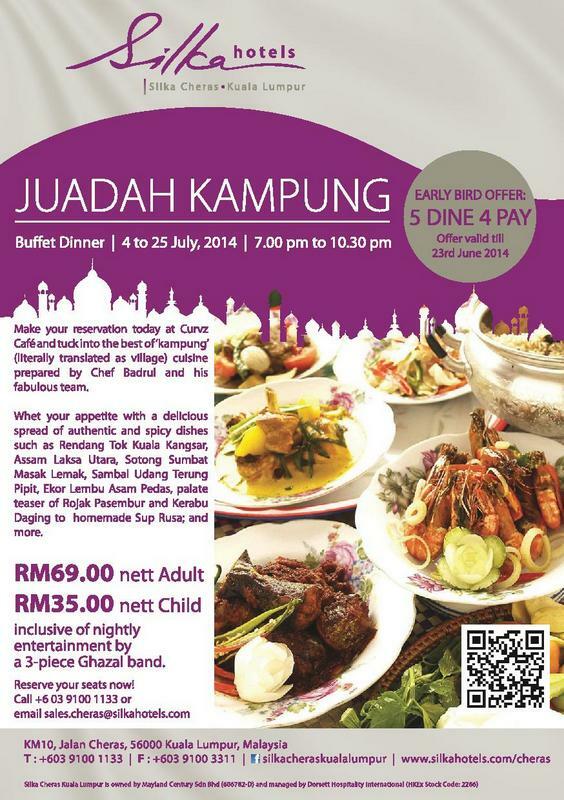 ‘Juadah Kampung’ is available on from July 4 to July 25, 2014 from 7pm to 10.30pm and is priced at RM69nett per adult, RM35nett per child. Reservations can be made via +603 9100 1133 or email sales.cheras@silkahotels.com. As always, nice pictures. So clear. Oh my, I've never tasted Sup Rusa. Haha. Hope to try it some day. And nasi briyani plus roasted lamb? Perfect. Now it's 5am and I regretted reading this post. Wakaka just kidding. But seriously, I'm hungry.